I can confirm this, it's by Fox. And the 'Gauntlet II' font was pixelized by Kevin Bulmer. The middle-scroll font was most probably made by Fox/DOM, Bonzai. 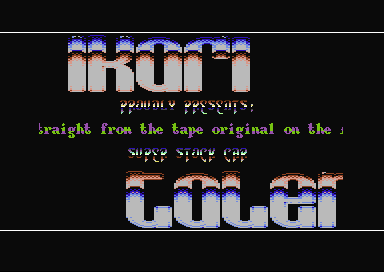 Capital 1X2 font from Gauntlet II, the other font is another, really wellknown one. I can't place it right now, though. the hunter: thanx for the fast answer =P. Naw, don't like this one. the hunter: rulez! you own with this one, really. respect, man! btw: you are also in charge of the gfx? who did the chars?